Merry Christmas from the Lane family! Our two boys had fun making this silly greeting for you and your family. Gabe has been obsessed with Nutcrackers since I took him to see the ballet with friends a few weeks ago. That was the inspiration here. On a more serious note, I wanted to share this illustrated poem that James, my poet-at-heart husband, wrote. He produced it for the tv show for Citychurch. He hired a voice actor to bring it to life, and he used his video production skills to make it very cool. James is so good at portraying emotions. This poem is the Christmas story from Joseph's point of view. I wrote and produced this for our upcoming Christmas show. Check it out. Merry Christmas! I hope you enjoyed our silly and serious Christmas videos. We are praying your Christmas is filled with love, joy, peace, and hope! We love you all! Love, James, Jennifer, Lucy, Andrew, Gabe, (and soon Hezekiah)! Due to the cold war and hippie movement of the last mid-century, our view of the word peace has been skewed. The word most associated with peace is war. When Jesus was born in that stable 2,000ish years ago, the world did not automatically become war-free or even conflict-free. King Herod sat on his throne and commanded assassinations and massacres, and Ceasar Agustus still commanded the roman military forces. War has just got uglier as history and science progressed. Unfortunately, the hippie version of peace was not what Jesus came to bring us. Fortunately, He instead was born and died to bring us peace with God. We can have peace with God. Because of Jesus, we can be right with Him. Through faith, and faith alone, we can be justified and we can be someone that God is pleased with. Because of Jesus, God can be pleased with us and at peace with us. This is the gift that Jesus lived and died to give, peace with God. We cannot earn this peace and rightness with God. We are unable to deserve this gift, and righteousness with God depends on faith in Christ. Merry Christmas this morning. This is the good news of the gospel: you can have peace with God! You can feel the glorious grace and none of the shame that would keep us from entering a relationship with our God. Because JESUS! Last week I wrote a post about how much I needed to let my armor down, have a soldier's reprieve, and slip into the warm, comfort of advent. I want to bask in who Jesus is and long for His coming. I wrote about how much we need hope and how God gives us hope, even though we don't deserve it. Today I'm going to talk about love. We need love, and one of the greatest challenges of our Christian life is oftentimes loving other people. People can make it easy not to love them. We can sometimes make it easy not to love us. Why do we do it? Why is accepting love often harder than giving it? I believe that it is easy to slip into the human, fleshly belief that we don't deserve love. If it wasn't, suicide wouldn't be the second leading cause of death of young people aged 10 to 24. I know everyone reading this has had that moment or several moments in their life where they didn't believe they deserved to be loved. I know I have. This is the worst lie the devil has up his sneaky sleeve, that we are not loved. Fear can easily turn into my main mode of operation, as a mother or just as a human. This time of year, I see more car accidents and people honking than all year long. I just want to yell at people to go home and drink some hot chocolate. Whatever they are rushing to can't be worth it. Fear is the easy voice to find in your head. It's loud and urgent. Love is there too, speaking softly. If we push it away and decide we are not worthy, it gets so muffled that we can barely hear it. Guess what? We aren't worthy, but God loves us anyway. We aren't worthy, but our family loves us anyway. Love isn't about earning. Love is freely given and never deserved. And God's love is the best. It's top-grade, pure, and good to the bone. It is hard to believe that we are allowed to receive the pure, unconditional love of God. But He gave it to us before we could even know to ask for it. He gave it to us before our cells formed into the DNA that makes you, you. He loved you first. The sending was from this love. Jesus came to Earth only because of this love. Receive it. Come to Him as a child and hold onto it with confidence. Hear it. Keep it close. We share it all year round. Just for a moment, get cozy with that overwhelming love that only God can give. Savor it and know that this love was poured out just for you. The last three years I have posted great ways that you could spend your Christmas money in wonderfully sweet ways, supporting vulnerable communities near and far. I've got a new list for Christmas 2016 that includes ideas from fair trade companies, give-back companies, and supporting missions. Your dollar can be powerful. The average household spent $830 on Christmas gifts last year. If we all took a percentage of that chunk of money and purchased from places that make a difference in our world, imagine the good that could be done. I am continuing my conviction to make my dollars count in a more meaningful way. I'm going to buy many of my Christmas gifts from companies who employ under-resourced workers, companies who cycle profits into vulnerable communities, retailers making a difference, local small businesses, and from families raising money for international adoptions. Before you head off to the mall this Christmas, consider purchasing some of these gifts that will give back to communities that need our support. Bonus sweetness: When you buy a present from Amazon (most of us will), use AmazonSmile. All you have to do is click a link to AmazonSmile before you shop, and a percentage of your purchase is donated to the charity you choose to support. Personally, I have been supporting our adoption agency AWAA who needs funds to continue caring for orphans in their transition home in Ethiopia. This is link to support AWAA through AmazonSmile. Use the link every time you shop at Amazon this holiday season. You can find adoption fundraisers to support this Christmas by searching "adoption fundraiser" on Etsy or you can join the FaceBook group "Gifts for Adoption." 1. Horn Vessel - Dark Horn Vase, $68, ravenandlily.com, empowering women in Kenya. 2. Vintage Gold Leather Bucket Bag, $159, ssekodesign.com, empowering women in Ethiopia. 2. Phrase Necklace, $48, livefashionable.com, personalize it - which is so in right now, creates sustainable business opportunities for women locally and globally. 4. Colornation Gloria Tote, $145, manoszapotecas.com, handwoven, fair trade, handmade according to time-honored traditions by Zapotec weavers in Teotitlán del Valle, Oaxaca, Mexico. 1. Great Expectations Necklace, $58, noondaycollection.com, empower women in Uganda, photo from @msrachelhollis's instagram, contact Nikki Pool. 2. Trade T-shirt, $15, fairtradefriday.club, support the women Mercy House supports around the globe. 3. Nautical Fringe Hook, $25, part necklace/part scarf/all cute, banded2gether.com, provides 3 meals in Uganda. 4. Love God & Serve Others Raglan, $42, persimmonprints.com, small business, gives a percentage back to the good shepherd agricultural mission. 1. 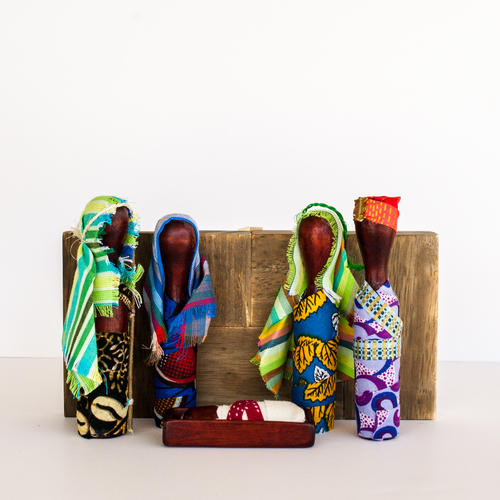 Bethlehem Nativity, $35, marketcolors.org, handmade in Kenya. 2. Slate Stone Serving Board, $28, tenthousandvillages.com, Authentic Fair Trade Product. Ethically sourced. Handcrafted in India. 3. Hope Bowl, $26, Trades of Hope, contact Rachel Clark, women who make these beautiful bowls are able to earn an income to feed their families and send their children to school. 4. Charcoal Soap, $20, theadventureproject.org. Buy a charcoal soap for your loved one, and one woman in Kenya will receive a new charcoal-efficient stove. 1. PowerLight Bundle, $79, bioliteenergy.com, reinvests funds to bring clean energy to the world. 2. Wooden Earphones, $15, youwood.org, percentage given to feed hungry, free slaves, and care for the orphan. 3. 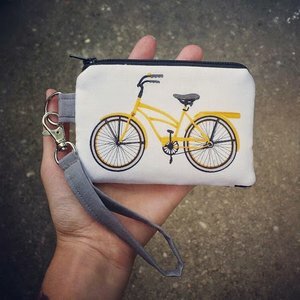 Toiletry Bag, $15, carry117.com, empower women in Ethiopia. 4. Waxed Canvas Tool Bag, $180, kithandkinshop.com, local, small business. 1. Rainbow Fish Zooties, $25, cometogethertrading.com empower communities in Kyrgyzstan. 2. Be a Nice Human Kids Tee, $17, unlockhope.com, supports Think Humanity, an organization that runs a hostel in Hoima, Uganda for young refugee girls from all across Africa, many of whom are orphaned. 3. 3-Car Garage, $30, thehungersite.greatergood.com, funds 50 cups of food. 4. The Hoot, $28, krochetkids.org, supports sustainable cycle of employment and empowerment in Uganda. 1. Take a Walk in My New Shoes children's book, $10, solehope.org, supporting hope, healthier lives, and freedom from foot-related diseases through education, jobs, and medical relief in Uganda. 2. Bear Felt Rug, $76, globalgoodspartners.org, made by formerly trafficked women artisans in Nepal. 3. Reading is My Favorite Youth T-Shirt, $20, readerlyshop.com, portion of profits go to eradicate human suffering caused by illiteracy. 4. Stuffed Alpaca Hammerhead Shark, $32, globalgoodspartners.org, empower women in Peru. HAPPY SHOPPING & MERRY CHRISTMAS! Don't forget about AmazonSmile! Use it every time you shop at Amazon. This is the link to support America World Adoption Agency. I like to include music with my blog posts. This week we lost Sharon Jones. She had an amazing voice. I had a chance to see her sing once, and it is a beautiful memory. You will be missed, Sharon. The last two years I have posted great ways that you could spend your Christmas money in wonderful ways, supporting adoptions, supporting missions, or buying fair trade items. I've got a new list for Christmas 2015! Your dollar can be powerful, and we spend a lot of dollars this time of year. Again this Christmas, I have made a decision try to make my dollars count in a more meaningful way. I'm going to buy many of my Christmas gifts from families raising money for international adoptions, companies who employ under-resourced workers, companies who cycle profits into vulnerable communities, retailers making a difference, and local small businesses. Bonus sweetness: When you buy a present from Amazon (most of us will), use AmazonSmile. All you have to do is click a link to AmazonSmile before you shop, and a percentage of your purchase is donated to the charity you choose to support. Personally I have been supporting our adoption agency AWAA. This is link to support AWAA through AmazonSmile. Use the link every time you shop at Amazon this holiday season. If you want more gift ideas, Kaylie and I podcasted about this topic on The Re:Podcast this week. Kaylie had some cool companies to recommend. Don't forget about this week's episode of The Re:Podcast - Shopping, socially-minded gift ideas. This is link to support America World Adoption Agency.